There were two American landings. May 10 1945 and Sept. 15 1945. Now let me clarify the two landings by the Americans and the significance of January 7, 1945. Although Mindanao was bypassed by the Americans to land in Leyte on October 20 1944, They continually assisted the Guerrilla movement in Mindanao through Submarine shipment, Air drops and aerial bombardment first by Carrier planes and finally by B24 Liberator land based bombers. The Liberation of Cagayan de Misamis was carried out by Maj. Fidencio Laplap and the 109th Guerrillas. Outgunned and out maneuvered, The Japanese left Cagayan de Misamis for Bukidnon by 3:00pm January 07 1945 and Maj. Laplap’s Guerrilla force stayed and did some mopping up operations in Cagayan de Misamis and in nearby towns from January 07 1945 until September 15 1945, when the US Army finally came to stay. 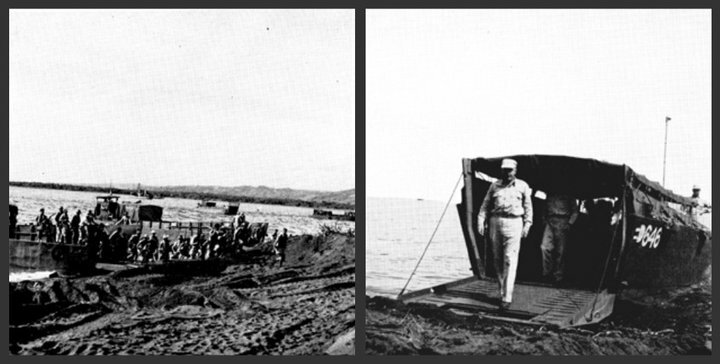 The May 10 landing at Macajalar Bay was made by the 108th Regimental Command Team of the 40th Division whose mission was to drive south along the Sayre Highway to link with elements of the 31st that landed earlier on April 17, 1945 in Parang Cotabato. When the Americans first landed in Bugo and Agusan (May 10 1945) they were assisted by the Guerrillas under Major Laplap in unloading their equipment, the Sept. 15 1945 landing by the Americans was to reinforce the Americans that arrived earlier and to relieve the Guerrillas in Cagayan. Cagayan was actually liberated 8 months before the end of the war. The May 10 1944 was the first Arrival of Americans in Macajalar Bay (they landed in Bugo). They landed without firing a shot, simply because it was in Guerrilla hands. American books, even TIME Life claimed that the Macajalar Landing was unopposed, and that Filipinos helped in unloading the equipment… but failed to mention the efforts made by Maj. Fidencio Laplap and the 109th Guerrillas.